This remnant of the former Nobelius Nursery, now known as the Nobelius Heritage Park, is a four hectare remnant of the once vast Gembrook Nurseries, developed from 1886 by Carl Axel Nobelius (1851-1921), which became one of Australia's foremost plant nurseries of the early twentieth century. 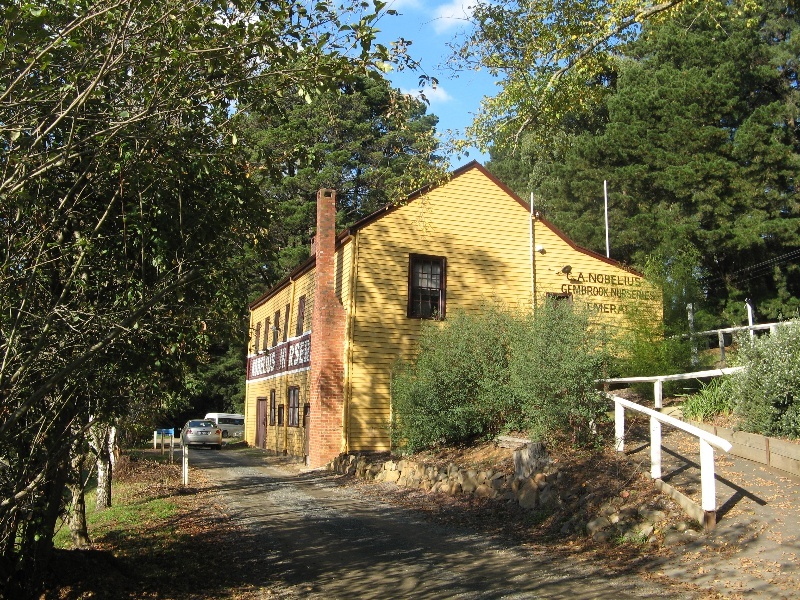 Carl Nobelius bought 25 ha of forested land near Emerald in 1886, established first a small orchard and in 1892 the Gembrook Nursery, named after the Parish. The business grew rapidly, and to avoid the difficulties of road transportation for his fruit and nursery stock Nobelius became a strong advocate for the construction of the narrow gauge railway line, now known as the Puffing Billy line. By 1900 the line was built and in 1904 permission was given to Nobelius to build a siding and packing shed adjacent to land newly-acquired for the nursery. By World War I the nursery, which was run as a family business by Nobelius and his four sons, held two million stock trees, produced large quantities of fruit, and conducted a huge export trade with other Australian states and overseas. In 1920 the nursery was said to be the largest in the southern hemisphere, and at its greatest extent covered 650 hectares, including the land occupied by the present Emerald Lake Park and Emerald Country Resort. However the outbreak of World War I largely destroyed the export trade, and after Nobelius's death in 1921 the nursery and orchards were subdivided and sold. Nobelius's sons Cliff and Arch regained control of this small part of the nursery and continued the business until 1955. The nursery closed in 1981 after two changes of ownership and the last remnant of the historic nursery was purchased by the former Sherbrooke Council to become the Nobelius Heritage Park, which focuses on the preservation and recording of the history of the area and its horticultural industries. The Museum contains an important collection of relics from the Nobelius Nursery, which includes ledgers, wages books, stock records dating from the 1890s, original catalogues, tools and photographs, and is considered to be a unique record of the nursery industry in Victoria. This remnant of the former Nobelius Nursery is located in the Dandenong Ranges east of Melbourne. It retains many examples of the trees planted by Nobelius and his sons, including two notable specimens: a rare Rewarewa (Knightia excelsa), the largest specimen of this rare tree in Victoria; and an outstanding specimen of the cut-leaf black alder (Alnus glutinosa 'Laciniata'). It also retains remnants of old nursery stock and features characteristic of the former nursery such as rows of trees planted at right angles to the contours. A dominant element in views from the nursery site is the two-storey timber packing shed adjacent to the Nobelius Siding on the Puffing Billy Railway. Many of the plants in the park were planted after the Nobelius era. There are plantations of lavender, rosemary, raspberries, eucalypts, New Zealand flax and fruit and ornamental trees established by Gus Ryberg, who once worked for the Nobelius nursery, as reminders of former Nobelius ventures and other local industries. 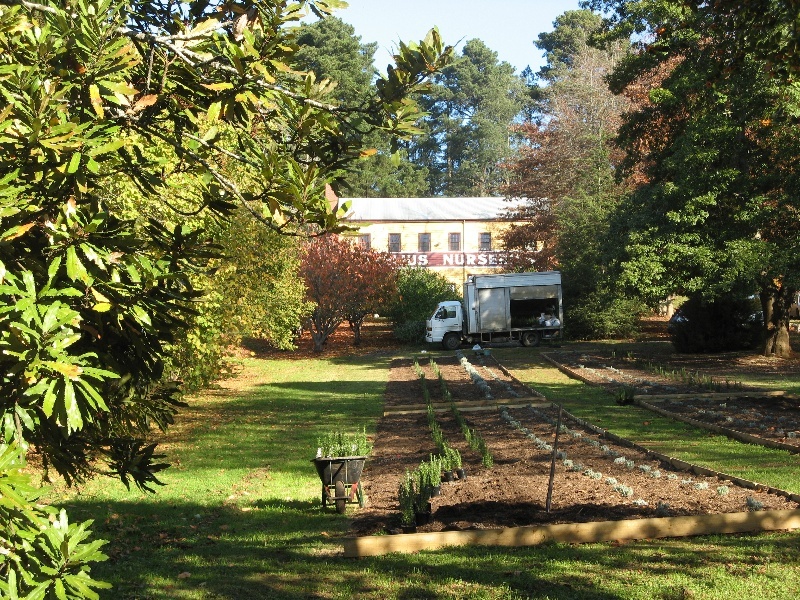 The former Nobelius Nursery is of historical and scientific (botanical) significance to the state of Victoria. The former Nobelius Nursery is historically significant as part of the vast Gembrook Nursery established by Carl Axel Nobelius from 1886. In the early twentieth century it was of one of Australia's foremost plant nurseries, and was described in 1920 as the largest nursery in the southern hemisphere. It was the originator of an extensive range of exotic plants and fruit trees, supplied other prominent nurseries of the era, and influenced garden and orchard plantings throughout Australia, as well as exporting to the USA, South America, South Africa, New Zealand, Europe and Asia. Through the supply of exotic trees to municipalities in many parts of Australia the Nobelius Nursery had a significant influence on Victoria's landscapes, including public parks, private gardens, orchards, avenues of honour and tree-shaded streets. 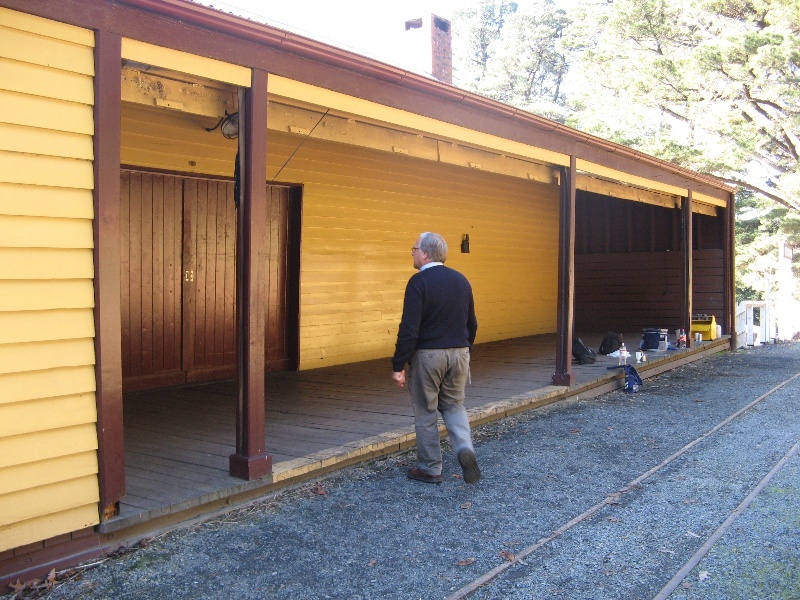 The nursery is significant for its association with Carl Nobelius, important for his association with the Belgrave to Gembrook narrow gauge railway line, now part of the Puffing Billy Railway. This was a facility sought and heavily used by Nobelius in his nursery and orchard business, and included a siding serving his packing shed, and also provided the local farming and nursery industries with easier access to their markets and so contributed to the development of the Emerald region. Nobelius is significant in the horticultural history of Victoria for his investigations into plant selection, particularly their suitability for local climates. The former Nobelius Nursery has scientific (botanical) significance for its site layout and linear planting, which demonstrate early methods of nursery production, cultivation and plant handling. It is significant for the retention of trees and other plantings from the time of occupation by Nobelius, including a rare Rewarewa (Knightia excelsa), the largest specimen of this rare tree in Victoria, and an outstanding specimen of the cut-leaf black alder (Alnus glutinosa 'Laciniata'), as well as remnants of old nursery stock, Victoria's first plantings of Chinese Gooseberry (Kiwi fruit, Actinidia chinensis), and a recent collection of Salvia species and cultivars. During the nineteenth century there were several major commercial nurseries in Victoria. The early nurserymen introduced exotic plants, took part in acclimatisation experiments, developed hybrids, promoted the use of trees for both fruit production and ornamental purposes and examined the growth habits and suitability of plants for different climatic zones and soil types, and in doing so contributed to horticultural knowledge in the new colony. Some nurseries, notably that of Sangster, were also responsible for the design of many gardens. The nurseries were responsible for changes to the natural landscape by providing plants for private and public landscaping. Many significant trees are located in areas which were once part of these commercial nurseries, although it is not always clear who planted them. Carl Axel Nobelius (1851-1921), orchardist and nurseryman, was born in 1851 in Finland, eldest child of a horticulturist. He was trained in horticulture and in February 1871 arrived in Melbourne. He was employed first in the Toorak nurseries of Taylor & Sangster. Later he moved to the nurseries of Joseph Harris in South Yarra, a step that had consequences, because Harris was an important influence in forging close links between himself, Brunning, Rimington, Cheeseman and Nobelius. Before 1900 these men were to control much of the nursery trade in Melbourne and were largely responsible for its successful combination of aggressive business drive, massive exports, strict quality control and restless inventiveness. In about 1884 Nobelius bought land near Emerald in the Dandenong Hills and for years went each Saturday afternoon by train to Narre Warren terminus and then walked sixteen miles (26 km) to his land, where he cleared, cultivated and planted before walking back to catch the Sunday night train. By 1890 he had established his business at Emerald; fifty acres (20 ha) of orchard and nursery were under cultivation and he was doing well with raspberries and strawberries as well as hard fruit for the markets in Melbourne and Sydney. One handicap was the cost of carting his produce to Narre Warren by bullock drays, but he told the parliamentary standing committee on railways in 1898 that 'all these ranges ought to be planted with apples [which] are not suffering from the drought this year in the slightest'. In 1903 he was able to advertise a million trees for sale. By 1914 his 'Gembrook Nurseries' held two million stock trees, produced quantities of apples and pears, and conducted a huge export trade with other Australian States and overseas with New Zealand, South Africa, India, Japan, Europe and South America. The size of export is indicated by annual shipments of 400,000 tree stock to South Africa alone. Nobelius's experimental skill and persistent advertising persuaded countless Australian country towns to line their streets with European shade trees and he made other contributions to Victorian horticulture, including a revival in the cultivation of flax. But the great heart of his business was the propagation and sale of fruit trees and fruit tree stock, augmented by a large apple and pear orchard which he established at Freshwater on the Tamar River in Tasmania. The nurseries, which were run as a family business by Nobelius and four sons, and which sometimes employed almost every wage-earner within reach, dominated the economic and social life of the Emerald-Gembrook district. The high period ended when the outbreak of World War I in August 1914 destroyed the export trade and compelled contraction and reorganization, but in 1920 the nursery was said to be still the largest south of the equator. Nobelius died of pneumonia at his home in Emerald on 31 December 1921. By direction of his will the nurseries and orchards were sold and the proceeds divided within the family. A son regained control of the central nursery and held it until 1955. In 1877 land was released for subdivision and sale from the Dandenong State Forest, which included part of the Emerald area. In 1886 Carl Nobelius purchased from an earlier fruitgrower, H B Koenig, about 25 hectares of hilly, mostly heavily forested land, in what was later to become the Emerald Country Resort, with the help of a loan from his employers Taylor & Sangster. While still working at Taylor & Sangster's South Yarra nursery Nobelius began clearing his land at weekends, travelling by train on Saturday afternoons to the Narre Warren station, riding or walking the 25 km to Emerald, and catching the train back on Sunday evenings. He occupied a cottage built by Koenig in 1880. By 1890 he had established a small orchard of 6 hectares. He also leased another 35 ha immediately north of the Koenig allotment, which in 1891 he applied to select. By 1892 Nobelius had established his own nursery business in Emerald, called Gembrook Nurseries after the name of the Parish, and with his wife and children (he was to have eleven, eight of whom survived) moved into a cottage on the corner of Sycamore Avenue and Lakeside Drive at Emerald. By 1898 the Gembrook Nursery comprised 20 ha, and in 1900 Nobelius purchased the freehold title. In 1898 as the nursery continued to prosper Nobelius was able to build an impressive 16-room house, Carramar, with an extensive garden of ornamental plants, both of which survive, on a hillside overlooking the nursery from the north. In 1900 he purchased adjoining allotments, with the nursery area increasing to 32 ha. By 1907 he claimed to have cleared a total of 121 ha (300 acres). Nobelius travelled widely to promote his business, advertised widely and circulated attractive catalogues with tempting descriptions of the fruits from the trees available. The success of the nursery was also due to the reliability and cleanliness of its stock, and to Nobelius's shrewd business sense, which enabled the business to grow throughout the 1890s depression by selling large numbers of trees to local and state governments, which created jobs by developing parks and planting street trees. Nobelius obtained seed from parks and orchards, from well-known suppliers of the day and from the fruit processing industry. He experimented with new varieties, importing from various parts of the world, for example apples from Sweden, France, the USA, Russia, the Baltic, Bohemia, England, New Zealand and Canada; and peaches from France, England, the USA and NZ, amongst others. As well as serving local needs, trees were exported overseas, including to the USA, New Zealand, South Africa, South America, Europe and Asia. Nobelius was a strong advocate for the construction of a railway line to Emerald, to avoid the difficulties of transporting trees 25 km over rough tracks to the railway at Narre Warren. Construction of the narrow gauge line from Ferntree Gully through Emerald to Gembrook (later known as 'Puffing Billy') began in 1898 and in 1900 the narrow gauge line reached Gembrook, and in 1901 the Emerald station was opened. In 1904 a siding was built adjacent to the nursery and Nobelius was given permission to build a packing shed next to the line, bordering land newly acquired for the nursery. By 1903 Nobelius was advertising that he had one million trees for sale. Between 1903 and 1906 he acquired new land to the south for growing nursery stock, known as the 'New Nurseries'. This had a frontage of more than 3 km to the new railway line. By 1909 the nursery had grown to more than 80 ha and two and a half million trees, with three million trees for sale just before World War I. At its peak before World War I the nursery employed more than eighty workers, encouraging the growth of the town of Emerald and providing winter employment to many local fruit growers. Nobelius ventured into other business areas, including flax for the manufacture of rope and twine, rosemary and lavender for the cosmetic industry and berry growing, but fruit and ornamental trees were the mainstay of his enterprise. At the beginning of the war Nobelius established a 40 hectare plantation of New Zealand Flax along the creek in what is now Emerald Lake Park. A small dam was made and a two-storey timber mill built below the present causeway across the lake for processing the raw fibre, and this operated from 1913 to 1926. The processed fibre was sent to Donaghy's Rope Works in Geelong or Kinnears in Melbourne to be made into rope and twine. The local eucalyptus oil industry led to the establishment of rosemary and lavender plantations in the present Lake Park area, but these enterprises collapsed during the war. At the beginning of World War I two million trees had been planted on 180 hectares, including 50 hectares purchased in the late 1890s, the area now known as Emerald Lake Park. However the war devastated overseas markets, and the nursery never fully recovered. 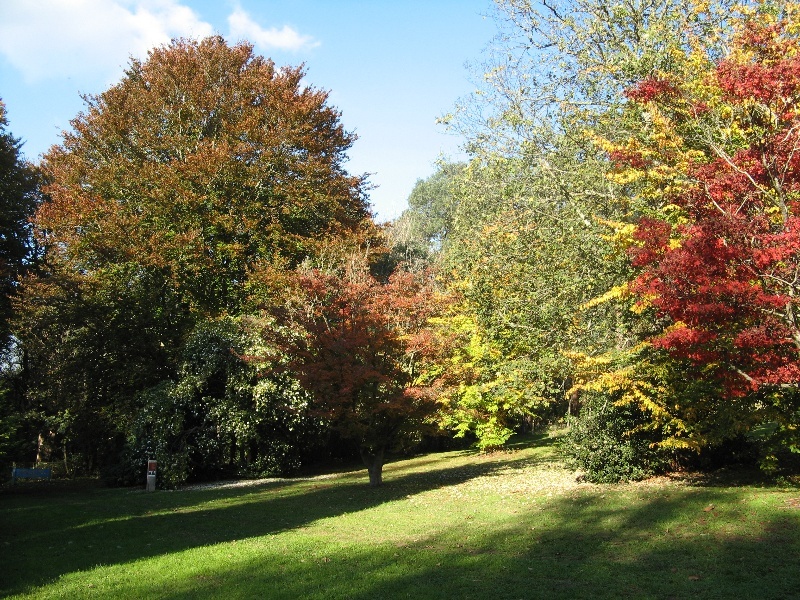 The beech, oaks, chestnuts and maples ploughed into the ground during this time have mingled with tree ferns and native shrubs to create a distinctive deciduous forest. Towards the end of World War I Nobelius was to supply trees for avenues of honour in many country towns. Following the death of Nobelius in 1921, the Nobelius estate was sold to two syndicates. One acquired about 240 ha north of the Gembrook Road to form the Emerald Country Club Estate, including the present golf course and the residential properties along Lakeside Drive. In 1924 Carl's son Arch Nobelius acquired 36 ha. 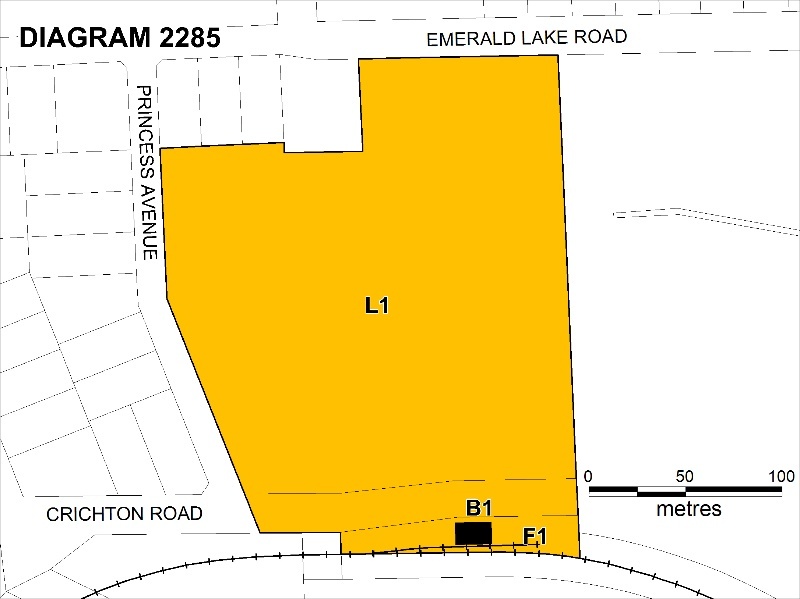 The rest of the property, consisting of one block of 35 ha, one of 70 ha and sheds, and one containing a house and 25 ha, purchased by another syndicate, included the area covered by the present Emerald Lake Park and the Nobelius Heritage Park. The second syndicate included Alfred Nicholas, who purchased many of the trees for his garden at Burnham Beeches from the Nobelius Nursery. The second syndicate, headed by W.H.Treganowan was encouraged by the Nobelius family and others to develop their land as a park. A.V. Nobelius (a son) and a surveyor named Web supervised this development, during which several attempts to establish a main lake in the area failed and the idea was abandoned. The Emerald Progress Association pressured local shires to approach the Victorian State Government to acquire the area as a park. They were successful and in 1939 the purchase was made and further development began. A new lake of 3.5 acres was finally established by the Ferntree Gully Council, a small nursery was established to supply trees for replanting and Emerald Lake Park was opened to the public in 1941. The nursery continued to operate, on the site of the present Nobelius Heritage Park and on additional leased land to the south of the railway line, under the name of C A Nobelius and Sons. It remained a family business, managed by Carl's sons Arch and Cliff Nobelius. The nursery's business office was located in the packing shed, with Cliff's wife, Daisy in charge. The business remained largely wholesale. Major customers were still parks and gardens and retail nurseries, as well as orchardists. The Emerald Country Club was an important customer during the 1930s and early 1940s. In the 1930s trees were still being still being supplied to customers overseas, but with World War II this largely stopped. Late in 1939 there was an unprecedented strike by the nursery workers over low pay and poor conditions, and although the workers' demands were met (but only for the men, not the women) many of the workers eventually left, and new staff were difficult to attract. By 1943 only 15 staff remained. The nursery continued to operate under the Nobelius family until 1955, when it was sold to nurserymen S and L Linton & Son of Clayton, though they kept the business name of C A Nobelius & Sons. The nursery was by now only 4.5 ha, with much of the former nursery land leased out. The Lintons built the cottage now known as Linton's cottage on the site of a former potting shed to serve as an office and caretaker's residence. In 1967 the business was sold to Din San Nurseries, and it became Din San's Nobelius Nurseries, Emerald. In 1981 the nursery closed and the owners applied to subdivide the land for residential blocks. However a public campaign began to save it, it was purchased by the Shire of Sherbrooke with help by the State Government, and in 1988 it opened as a heritage and passive recreation area. Gus Ryberg, a former nursery employee became the voluntary curator, and developed a plan for the park that aimed to preserve the nursery environment as a reminder of its origins, for example planting in rows as for the nursery planting, while replacing old plantings and establishing new commemorative plantings. A row of apple trees commemorates the importance of both nursery production and fruit growing in the Emerald district. A row of raspberries commemorates the berry industry, in which Carl Nobelius played a significant role. Two rows of eucalypts, mountain ash (Eucalyptus regnans) and messmate (Eucalyptus obliqua), have been established to commemorate the timber industry that once thrived in the area. A row of Camden woollybutt (Eucalyptus macarthuri) at the eastern end of the park commemorates the importance of the early eucalyptus oil industry in Emerald. A small plantation of lavender is a reminder of the one of Nobelius's less successful enterprises, but one that was significant elsewhere in Emerald. Continuing the Nobelius tradition of experimentation, a garden of salvias was planted in 1989 to trial and display a collection of the genus Salvia (sage) on behalf of the Garden Plant Conservation Association of Australia. Nobelius Heritage Park, Emerald (bounded by Emerald Lake Road, Princess Avenue, Emerald Lake Park and the Puffing Billy railway line), is a remnant of the former Gembrook Nurseries Emerald, established c1886 by Carl Axel Nobelius (1851-1921) and developed into Victoria's, and possibly Australia's, foremost plant nursery operation of its time. While Nobelius' early operations were initially developed on land elsewhere in Emerald, cultivation of this site is known to have been established c1903, in an expansion which formed the most important phase and the 'peak years' in the development of the Gembrook Nurseries. The scale and extent of Nobelius' operations, demonstrated in the records of his extensive export markets, included USA, South America, South Africa, Europe and Asia, India and New Zealand. During the First World War (1914-18) the loss of overseas markets led to a decline in the Victorian and Australian nursery business. Nevertheless, Nobelius' drive to further expand business continued, for example, as shown by the purchase of land and development of apple orcharding operations in Tasmania which are thought to have constituted the largest of their kind at the time in the Southern Hemisphere. A significant figure in the development of Emerald and its community, Nobelius successfully lobbied for the establishment of the narrow gauge railway line (originally running from Ferntree Gully to Gembrook and now commonly associated with Puffing Billy) as a key facility for the transport and distribution of nursery plants as well as other local agricultural products. The railway was heavily used by Nobelius in his nursery and orchard business, and a siding and at least one packing shed adjacent to the Park remain from this period. The timing of purchase of the Nobelius Heritage Park land, with direct railway frontage, correlates directly with the establishment of the rail operations, and shows a clear anticipation by Nobelius of the economic potential this new service could offer. After Nobelius' death, nursery operations were purchased by a syndicate, and continued on this site under various names and owners (and over various areas of land), including as Nobelius Stations Estates (on land including the present Park site) and Emerald Pty Ltd. Nobelius' sons Cliff and Arch were involved in the operations at least at a site management level if not in ownership. Nursery operations on-site were continued under the Nobelius name from 1955 by Linton & Son, and subsequently by E. Smith when it functioned as the Din San's Nurseries Emerald until 1981. In 1981, Nobelius Heritage Park was purchased by the former Sherbrooke Shire in response to community lobbying and with State financial assistance, to commemorate and salvage land associated with the once-great nursery operations of Nobelius. 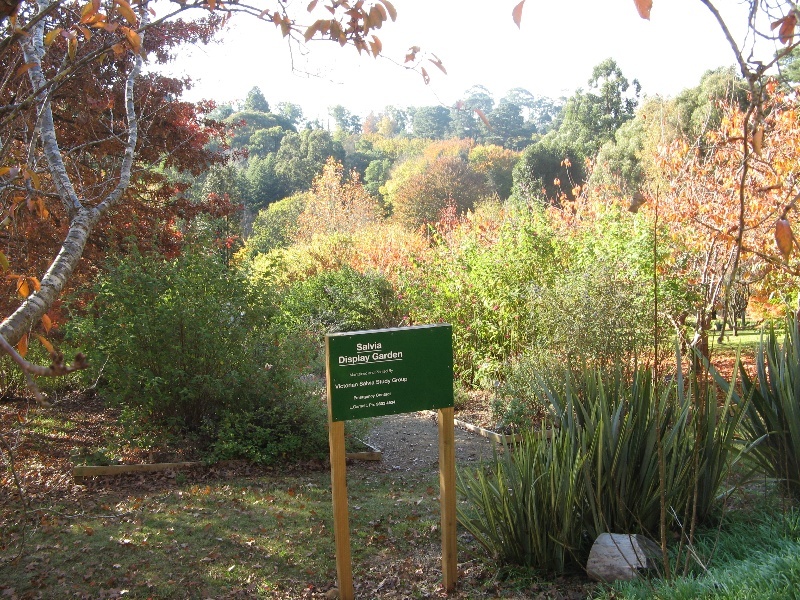 The former Nobelius Nursery is part of the vast Gembrook Nursery established by Carl Axel Nobelius from 1892. In the early twentieth century it was of one of Australia's foremost plant nurseries, and was described in 1920 as the largest nursery in the southern hemisphere. It was the originator of an extensive range of exotic plants and fruit trees, supplied other prominent nurseries of the era, and influenced garden and orchard plantings throughout Australia, as well as exporting to the USA, South America, South Africa, New Zealand, Europe and Asia. Through the supply of exotic trees to municipalities in many parts of Australia the Nobelius Nursery had a significant influence on Victoria's landscapes, including public parks, private gardens, orchards, avenues of honour and tree-shaded streets. The former Nobelius Nursery is significant for the retention of trees and other plantings from the time of occupation by Nobelius, including a rare Rewarewa (Knightia excelsa), the largest specimen of this rare tree in Victoria, and an outstanding specimen of the cut-leaf black alder (Alnus glutinosa 'Laciniata'), as well as remnants of old nursery stock. The former Nobelius Nursery has scientific (botanical) significance for its site layout and linear planting, which demonstrate early methods of nursery production, cultivation and plant handling. 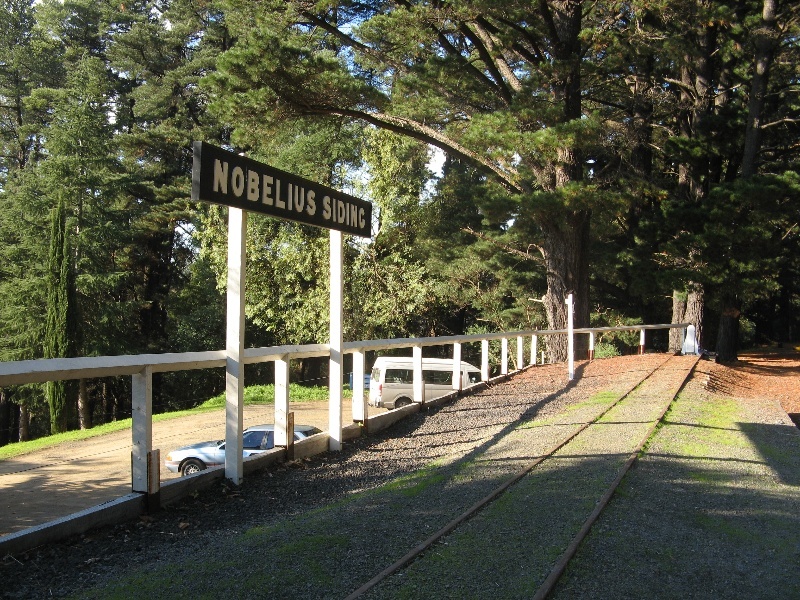 The nursery is significant for its association with Carl Nobelius, who is important for his association with the Belgrave to Gembrook narrow gauge railway line, now part of the Puffing Billy Railway. This was a facility sought and heavily used by Nobelius in his nursery and orchard business, and included a siding serving his adjacent packing shed, and also provided the local farming and nursery industries with easier access to their markets and so contributed to the development of the Emerald region. Nobelius is significant in the horticultural history of Victoria for his investigations into plant selection, particularly their suitability for local climates. This is a remnant of the once vast Gembrook Nursery, developed by Carl Nobelius from 1886, which became one of Australia's major nurseries and was influential in the plantings of the state's gardens, landscapes and orchards. General Conditions: 1. All exempted alterations are to be planned and carried out in a manner which prevents damage to the fabric of the registered place or object. General Conditions: 2. Should it become apparent during further inspection or the carrying out of works that original or previously hidden or inaccessible details of the place or object are revealed which relate to the significance of the place or object, then the exemption covering such works shall cease and Heritage Victoria shall be notified as soon as possible. General Conditions: 3. If there is a conservation policy and plan all works shall be in accordance with it. Note: A conservation plan provides guidance for the management of the heritage values associated with the site. It may not be necessary to obtain a heritage permit for certain works specified in the management plan. General Conditions: 4. Nothing in this determination prevents the Executive Director from amending or rescinding all or any of the permit exemptions. General Conditions: 5. Nothing in this determination exempts owners or their agents from the responsibility to seek relevant planning or building permits from the responsible authorities where applicable. Landscape Maintenance : * The process of gardening, including mowing, hedge clipping, bedding displays, removal of dead shrubs and replanting the same species or cultivar, disease and weed control, and maintenance to care for existing plants. * Repairs, conservation, and maintenance to hard landscape elements, buildings and structures, fountains and monuments, steps, paths, paths and gutters, drainage and irrigation systems, edging, fences and gates. * Removal of dead or dangerous trees and vegetation, works to maintain fire safety and to conserve significant buildings and structures and emergency works, provided a report is submitted to the Executive Director within 21 days. * Replanting the same plant species which conserves the significant landscape character and values including specimen trees, avenues, rows, shrubberies, flower beds, and lawns, provided a list and plan is submitted to the Executive Director for approval. * Management of trees in accordance with Australian Standard; Pruning of Amenity Trees AS 4373-1996. * Management of trees in accordance with Australian Standard; Protection of Trees on Development Sites AS 4970-2009 * Subsurface works involving the installation, removal or replacement of watering and drainage systems or services, outside the canopy edge of significant trees in accordance with .AS4970 and on the condition that works do not impact on archaeological features or deposits. * Removal of plants listed as noxious weeds in the Catchment and Land Protection Act 1994 * Vegetation protection and management of the possum and rabbit population. * Repainting the same colour of previously painted surfaces Minor Works : Note: Any Minor Works that in the opinion of the Executive Director will not adversely affect the heritage significance of the place may be exempt from the permit requirements of the Heritage Act. A person proposing to undertake minor works must submit a proposal to the Executive Director. If the Executive Director is satisfied that the proposed works will not adversely affect the heritage values of the site, the applicant may be exempted from the requirement to obtain a heritage permit. If an applicant is uncertain whether a heritage permit is required, it is recommended that the permits co-ordinator be contacted. The purpose of the Permit Policy is to assist when considering or making decisions regarding works to the place. It is recommended that any proposed works be discussed with an officer of Heritage Victoria prior to making a permit application. Discussing any proposed works will assist in answering any questions the owner may have and aid any decisions regarding works to the place. The Nobelius Heritage Park Strategic Conservation Plan completed by Context in 2004 will assist with the future management of the cultural significance of the place.